and another explainer film episode for DBV. In the German Game Autobahnpolizei Simulator 2 by Aerosoft Anni is voicing the press spokesperson of the police Leonie Roth, a combat medic and a crash victim. The game will be released December the 7th 2017. Anni speaks 3 internal explainer films for the in-store staff of adidas. Anni speaks an imagefilm for Convention Partner Vorarlberg. In an internal explainer film for smart Anni goes into detail about the topic “perception during the visit of a workshop, to teach the staff in making it as enjoyable as possible for their customers. In November Anni speaks another navigation layout for VW. Anni speaks a young and cool web-spot for 20squares. Anni speaks a radio ad for Subway – epic, cool, funny – and points out to the Epic Day in November. Anni speaks a commercial for Allianz about the future precaution and pension insurance and that you don’t always have to decide in life – especially when it comes to safety and yield. TV Release November 13th 2017. For Sky Deutschland Anni speaks an internal explainer film. The extensive addon Ragnarök of the action role play Titan Quest has been released November the 17th 2017. Anni speaks several characters: Elise, a rich citizen and mine widow from Heuneburg, a valkyrie, the oracle Gylfi Volva, Kaupengr Spakona and EldjotounInfernal. The society coach@school, that works close together with the Hamburger Landesinstitut für Lehrerbildung und Schulentwicklung (LI) and the Schulbehörde and goes into educational sponsorships with schools in deprived areas, started a new project: the first multilingual Hamburger Bücherkoffer. Anni gives the trainings to parents of first and second grade pupils and supports them in reading with their kids, releases fears and reservations and gives the parents useful tools for multilingual reading with children for all day life. In the long term the kids should be strengthened by the reading and be empowered to read themselve. Speaking skills, grammar, spelling, creative thinking and much more will be benefited. Find detailed informations about the Hamburger Bücherkoffer, donation opportunities and contact for your school here. Fresh from the hands of the photographer Theo Groen: Anni’s new headshots are online. Shot in July 2017, the pictures give an updated view on Anni and her character profiles. In the strategy game Total War: Arena by Wargaming Anni speaks the Illyrian commander Kynane, a perfect sharpshooter with the bow. Anni speaks a mystic explainer film about the HP Multi Jet Fusion 3D-Printer for solidpro . In September Anni speaks a few new modules for Rayz Headphones. September the 19th 2017 season 2 of the successful game video Minecraft Story Mode by Telltale and Mojang will be released with a German language version. Anni speaks Petra (picture / on the left) in the German version, the best friend of the main character Jesse. An enthusiastic, cool, combative nature with a dry sense of humor, caustic sarcasm and a big heart. Watch some snippets of episode 1 on the left. The app Pokémon Spielhaus by Nintendo for kids from 3-5 is available now on Google Play (Android) and App Store (iOS) for free. Anni speaks the gamemaster Lina in the German language version. A teenage girl, that leads the kids friendly and motivational through the games and the house, reads stories to them and helps when something doesn’t really work out. and pitsh films for Schott and the Sparkasse Südholstein. The play and learn app Monster School by Yuma LLC for kids is out now. Anni speaks a Pre-Roll for a special offer week from Rossmann. August the 21st 2017 3-4 pm Radio ZUSA publishes a special radio segment of the Initiative BGE Lüneburg – Wendland report. Anni speaks a BGE supporter in a dialogue with a sceptic. 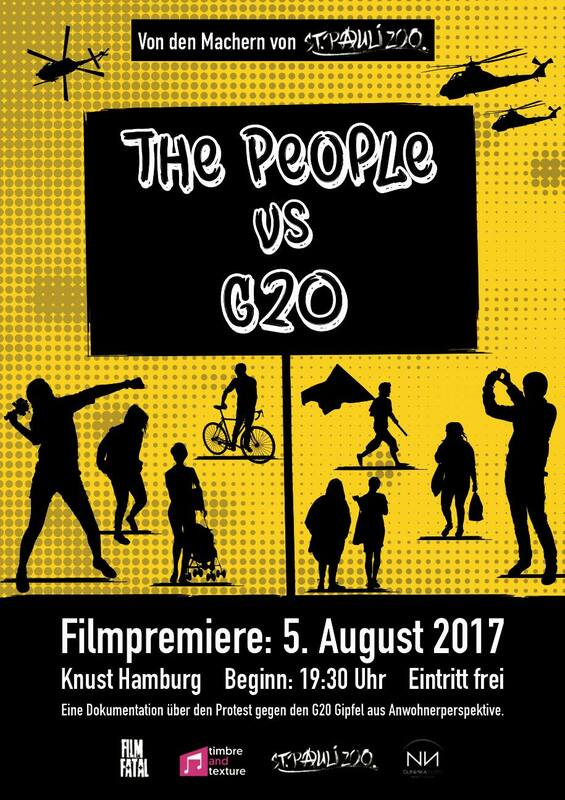 August 5th 2017 at 7.30 pm the short documentary The people vs G20 will be shown in front of and inside KNUST in Hamburg. Afterwards there will be time for communication about own experiences during the G20 summit 2017 in Hamburg. The documentary shows from local resident’s perspectives how the G20 summit affects the public life in Hamburg and how people deal with it. It is the outcome of a collective of free filmmakers from Schanze and St. Pauli. Produced by Film Fatal (Director: Julian Schöneich) Sunnika Films (Anni & Jerry) supported the project as a camera team and delivered pictures. Unfortunately Anni won’t be in Germany for the premiere and can’t attend it in person. Anni is on holiday July the 28th – August the 13th 2017 and is not available by phone. and a few new modules for the phone system of DZ-4. playful, cuddly, a bit vain, demanding and attention seeking – just like a cat. The film is available online in a 360° version and on events with virtual reality glasses. In Black Mirror 4 by dtp entertainment Anni speaks a loving, vicious aunt in the German language version. Anni speaks another recruiting spot for Lidl – this time for executives. FUTURA is on the search for new personal assistants for their growing client number, that needs care, support or consulting. Anni speaks an amusing recruiting film for the company. For Stiftsquelle Mineralwasser Anni speaks the voiceover for an atmospheric imagefilm. Anni supports Lieferschotte with her voice to find investors for their campaign on CONDA. For Daimler Mercedes Anni motivates employees and explains the functions and sense of the control tool “Netto Null”. For the DeGeWo Anni speaks an explainer film and informs about the innovation competition Smart Up The City 2017. Anni speaks an imagefilm for Gansch Tech and informs about the company’s principles. After a successfull exhibition of the short film series “Poetry” by Dara Friedman several revwies have been published. 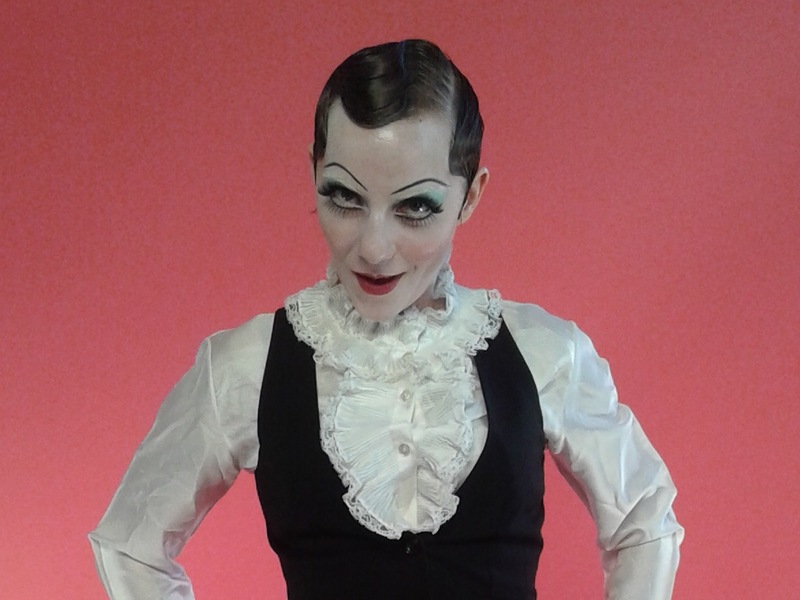 Anni play a cabaret artist in “Als kein Ausweg zu sehen war”. and the german voice prompts for Rayz Headphones. In the multiply awarded third-person-shooter with adventure parts Mafia III by 2kCzech (formerly Illusion Softworks) Anni speaks a cult triggerwoman, a female cult blade and the conspiratorial Dottie. Anni speaks for Quantcast again. This time an explainer film about Quantcast Measure. For Homann salads Anni speaks two national radio comemrcials – a caring, warm mother and a leasure, fun partner. Anni explains how you can plant trees, by clicks – for Treedom. In April Anni speaks a radio commercial for EnviaM again and whets appetite for sunshine and solar cells. and an internal explainer film for the DBV. Anni plays a cabaret artist and speaks the poem Als kein Ausweg zu sehen war by Erich Fried, in an experimental shortfilm series of the artist Dara Friedman from New York. and will be shown until July the 3rd 2017 in the gallery. Anni speaks a short online commercial for Runtastic, to call fitness lover’s attention for the new app Runtasty, that complements the training with the right and healthy food. Anni speaks an imagefilm and a short version for the Oberösterreichische Gebietskrankenkasse. Anni speaks for the Movie Park Germany again. She guides the visitors as the computer voice of the Star Trek Enterprise through their operation. Furthermore she speaks superintendent Brand, who instructs her new cadets in their training mission. For Cell Solution Anni explains the functionality of cell solution fibers and how they help to sleep comfortably and wake up refreshed. With her voice Anni follows her inner compass over the Top Trails of Germany. and for the Autohaus Leeb in Austria. Anni also speaks again for Schopf – this time in celebration of a new opening. For Shire Anni speaks an employee film about the new portal and contact center HRConnect. Anni is the German voice for the Lidl recruiting campaign 2017 and speaks 9 fresh commercials and one imagefilm for future applicants about the topics appreciation, growth, development, career and much more. The imagefilm can be viewed on youtube (see left) and the spots are running now. Anni explains the new Sales Navigator for LinkedIn in the German language version and guides step by step through all functions, so that no questions remain unanswered. In an explainer film for the social election of the Sozialversicherung für Landwirtschaft, Forsten und Gartenbau (SVLFG) for Deutscher Jagdverband, Anni explains the procedure and why it is important to use your vote. Anni speaks the voiceover of the photographer Bete van Meuween, about her work and what she likes about the photobook from fujifilm. Anni speaks two fresh radio commercials for EnviaM. In an educational film, Anni moderates opticians through the usage of the DNEye Scanner® from Rodenstock. In February Anni speaks a character again for Realias Learning. This time the nurse Derya. Furthermore she speaks an explainer film for the web portal Aktiv mit MS which explains the new functions after a website relaunch. Anni speaks another ongoing role in the I-Pad strategy game Soldiers Inc. Mobile Warefare by Plarium: the tutorial voice, that gives instructions to the player in a Siri manner. In January Anni speaks an educational film about the usage of the DNEye Scanner from Rodenstock for opticians. She also gives her voice to an explainer film for the researchers of Shire and the Gesellschaft für Mukopolysaccharidosen e.V. about the topic „Morbus Hunter“. Anni speaks for Raiffeisen again. This time a company internal imagefilm for the 200. birthday of the social reformer Friedrich Wilhelm Raiffeisen, who was the co-founder of the cooperative movement and name giver for the Raiffeisen Organisation. In a pre-roll Anni speaks the thoughts of a young woman about her business career and future for the online portal Xing. Campaign starts in January 2017. The musicvideo All For You from the band Never Come Rain, with Anni in the leading part of sci-fi fighter Xi is online now. Anni is also present on the cover of the single that is available in stores and online shops now. The whole January Anni speaks a comprising explainer film project as the German voice for all medical devices, such as CT scanner or MRTs, by the Siemens Healthineers. She explains doctors and medical researchers in the German-speaking world, how the programs and evaluation work, to help making the clinical routine, as well as complex proceedings in research and diagnostics, easier, more efficient and effective. Anni speaks an imagefilm for the Stadt Sindelfingen in Baden-Württemberg. January the 20th at 10.30 pm Anni is on screen again as Anette in 3,72 (Regie: Jasper Zeitz). This time in Hamburg at the Shortfilm Slam in the Zeisekino.